Yesterday I wrote about academic controversy and how it can be used in the classroom. I promised a list of various sources and you can find it below. A few things need to be clarified about this list, however. I would never use the online sources I provide here by merely printing them off “as is” and hand them to students. I would not use blog entries as classroom resources nor would I direct students to websites unless they were of the scholarly type such as online journal articles or sites belonging to the National Parks Service. I’ve used information from many of these sources but have repackaged them to fit the needs of students. When preparing an academic controversy type lesson for students it is very important to provide information from both sides of an issue. This should not be an activity where the instructor is attempting to guide all students to one particular point of view. The point is for students to examine and analyze the information presented in order to come up with their own opinions and to be able to state those opinions in a clear and logical manner. Snowden’s diary entry is a good example for students to use when determining reliability of a source and when determining the type of source such as a primary document or secondary source. In the past I’ve used activities where one student tells a short account of an event to another student out of the hearing of the rest of the class. The second student then goes to his/her desk and writes down what they were told. The second second student then visits a third and reads his/her account to a third student who in turn writes down what he/she heard in order to read it to a fourth student. This process continues until all students have been told and have written down the account ending with the first student who writes down the last account. Then we compare the original story to the the final account. Students are amazed at what has been left out and what has been embellished in the account. 2. This site supports Pott's story and also includes the fact that he supervised the grinding and delivery of the grain which Washington had requested that local farmers provide for the army. I have not seen this mentioned in a scholarly account. 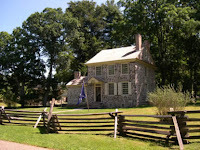 The National Parks Service site currently states the Potts home was Washington’s headquarters. 4. Chapter 13 from A History of the Life and Death, Virtues and Exploits of General George Washington by Mason Locke Weems better known as Parson Weems. It is Parson Weems who has the honor of spreading the cherry tree myth as well and the account of the prayer at Valley Forge. 5.Arnold Friberg, the artist who completed the painting of Washington in prayer, explains in his own words the reasons why he completed the painting and the research he conducted in the process. From the site Friberg states The well known American legend is without documentation. But from Washington's own words there can be no doubt of his deep and humble dependence upon whom he chose to call "that all wise and powerful Being on whom alone our success depends. 7. Over at Boston, 1775 J.L. Bell provides information regarding the story that Washington saw an angel at Valley Forge. 9. Did Washington Pray at Valley Forge?---an article from Coral Ridge ministries which mentions Paul Boller, a historian and noted presidential expert, who discounts the story. The article also mentions five people who gave account of the event. Jared Sparks, an early Washingtion biographer, is also mentioned. 10. Taking the Measure of Washington....Once More---an online article by Michael J. Lombardi at the Journal of Colonial Williamsburg Foundation. This article examines the painstaking efforts historians go to to make sure we are getting an accurate and not romanticized picture of Washington. 13.The National Parks Service site for Valley Forge provides An account of the conditions at Valley Forge, and at this parks service site we are told the Potts home was Washington’s headquarters while this article advises where all of Washington’s officers slept. 16.American Heritage Magazine---reviews the book American Creation by Joseph Ellis and recounts the chapter on Valley Forge is the book’s strongest. He points out that Washington’s army was made up not of the sturdy Massachusetts farmers of Lexington and Concord fame but rather of “indentured servants, recently arrived immigrants from Ireland or Scotland, emancipated slaves, landless sons from New England, mechanics from Philadelphia. They represented the poorest strata of American society, there because, truth be known, they had no brighter prospects.” Neither were they all huddled together en masse at Valley Forge. “The headquarters of the Continental Army was located there, to be sure, but the army itself was deployed in a wide arc, stretching from northern Delaware up through Valley Forge, then around to southern New Jersey.” That winter, as Gen. William Howe’s British troops stayed warm and ate well in Philadelphia, Washington’s ragtag army starved and froze. From an initial troop level of about 12,000, the force was depleted by early spring to about 5,000 before reinforcements arrived. 17. In an online interview John Ferling author of Almost a Miracle: An American Victory in the War of Independence states I don't agree that the army nearly collapsed [at Valley Forge]or that America verged on having to end the war during the Valley Forge winter. After the great victory at Saratoga in October, two months before Valley Forge, it was generally presumed that France would enter the war. It was also thought that with French assistance, the war could be won, and probably fairly quickly. During the Valley Forge winter I think most Americans believed that they were too close to winning independence to throw in the towel. I would also suggest that if you are interested in further resources please refer to my original post and take a look at the comments section where many great opinions and ideas were put forth and The Tour Marm and Ed over at Millard Fillmore's Bathtub provided some additional sources/links as well. Controversy…our very world is full of it! It only takes a few clicks in the blogosphere to become embroiled in one controvery or another and everyday it seems we are heaping on more and more controversy involving subjects from religion to politics and from education issues to social ones like teen pregnancy or abortion. Historians have their fair share of controversies as well---the atomic bombing of Hiroshima and Nagasaki, the Crusades, the causes and effects of any war---and because there are no definitive black or white answers due to individual analysis and conjecture many issues remain controversial until more evidence is located that cannot be refuted in any way. Think about it for a minute…you see something in a blog, newspaper, or book that goes against the grain, your ire is up and you want to voice your own opinion in response. Many of you would rely on your own prior knowledge and a large number of you would dig a little deeper to verify some of the things you disagreed with in the original article….just to make sure, you know. In the process your horizons are broadened just a bit with some of your prior knowledge being confirmed and some of it being thoroughly debunked. You, my good friend, have learned something in the process. I’m not one that really wants to get embroiled in a controversy and at first glance I might balk at the idea of actually planning for one in the classroom! Who needs the hassle, right? In his book Creative Controversy---Intellectual Challenge in the Classroom , Dr. David Johnson advises conflict has considerable value for educators and students when the controversy is managed constructively [by the teacher]. Controversial questions can actually teach students to deal with all types of controversy; they can help to structure debate in the classroom, and reinforce conflict resolutions skills. Dr. Johnson advises academic controversy exists when one person’s ideas, information, conclusions, theories, and opinions are incompatible with those of another party, and both parties have to reach an agreement. However, in today’s world where many believe controversial issues have no gray areas but are either white or black we see no concessions or even a hint of an admission that with some issues we simply don’t have enough information to have an exact answer. 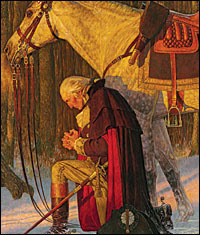 Last week’s wordlesss image was a portion of a painting by Arnold Friberg called VaThe Prayer at Valley Forge (1975). An earlier engraving of Washington’s Prayer by Henry Brueckner also exists. Friberg explains in his own words the reasons why he completed the painting and the research he conducted in the process. From the site Friberg states The well known American legend is without documentation. But from Washington's own words there can be no doubt of his deep and humble dependence upon whom he chose to call "that all wise and powerful Being on whom alone our success depends." *A man, George Washington, is praying. Some believe it is wrong to show public school students an image of someone in prayer. I’ve read where this painting has been banned from public buildings including schools, but I have no specific locations. *There is a strong religious message as you view the painting that sends the separation of chuch and state crowd into a tizzy. *Washington in prayer?!? Some believe Washington was Christian while others argue he was a Deist and not a Christian. *The backstory behind the painting is suspect and many historians argue that it is nothing more than an American myth. I strongly feel there is nothing illegal or irresponsible by showing students the painting by Mr. Friberg. As many of my commentors suggested this image can be used to teach about Valley Forge, American myths, the evaluation of historical sources, and can even lead to a discussion on the exact wording of the Constititution regarding freedom of religion and as Polski3 stated Jefferson’s own opinion regarding the separation of church and state. Everyone had really great ideas concerning how to use the painting. Following Dr. David Johnson’s ideas on academic controversy, however, I have in the past shown the painting to students and discussed its background. After carefully pairing students together I have provided them with several bits of information concerning the various controversies surrounding the painting that I mentioned above. The trick with a lesson surrounding academic controversy is to allow the students to explore the information, evidence, and points of view and allow them to arrive at solutions on their own. Each team receives information based on only one point of view. They must digest the information and understand the point of view so that they can relate the position to their partner. After both sides have been presented the partners trade information and the process begins again resulting in each partner presenting the alternative point of view. Many students state it is very interesting to see how differently their partner can interpret the same information. Following the second set of presentations the partners work together to analyze both sets of information and they attempt to discover which point of view seems the most plausible. Finally, students synthesize their new knowledge by arriving at a concensus that each student must word on his or her own in writing to turn in. Sometimes the concensus my students have arrived at is simply agreeing to disagree while others disagree greatly with one point of view but certainly understand where it came from. I have found these types of activities motivate my most reluctant students and also begin to help them understand how to listen to a different point of view that can affect their lives inside and outside of the classroom. Our hot-button issues in history, science, religion, politics, education, and our social and cultural lives aren’t going away anytime soon. What concerns me is it doesn’t seem that any of the sides to an issue are willing to concede even an inch of ground to move on. Unfortunately some controversies are not white or black. They are very gray, and allowing students an opportunity to mix points of view in order to see the gray is a very powerful thing to do---not necessarily to teach tolerance or to teach compromise at all costs, but to teach students what it is to have an intelligent informed dialogue regarding controversial subjects and to understand with some issues we might never have a meeting of the minds. 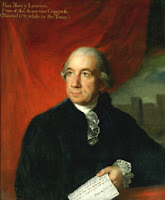 Tomorrow I will post a list of various online sources that can be used to formulate materials for students to view when Friburg’s painting is used in an academic controversy lesson. Welcome to the midway of the 151st edition of The Carnival of Education! Here's the very latest roundup of entries from around the EduSphere. Unless clearly labeled otherwise, all entries this week were submitted by the writers themselves.Folks interested in hosting an edition of the C.O.E. should please let Edwonk know via this email address: owlshome [at] earthlink [dot] net.Thanks to everyone who helped spread the word about last week's midway, which was hosted over at The Education Wonks. Visit the C.O.E. 's early archives here and later archives there. Next Week's Carnival will be hosted by So You Want to Teach? Contributors are invited to send submissions to: joel [at] soyouwanttoteach [dot] com, or, easier yet, use this handy submission form. Entries should be received no later than 6:00 PM (Eastern) 3:00 PM (Pacific) on Tuesday, January 1, 2008. Please include the title of your post, and its URL, if possible. Barring any unforeseen circumstances, the midway should open Wednesday, January 2, 2008. Can students take pictures of you and place them on the Internet or release them to the press?Ms. Cornelius presents Smile, Teach! It's Candid Camera! posted at A Shrewdness of Apes. Are schools losing the ability to make rules? Do you think it is because they have been abusing their authority? Give Judy an answer after you read her post Tiggers Are Wonderful Things After All posted at Consent Of The Governed. In short, we want high standards, we want high expectations, we want students to behave and learn. But at the same time, we don't want to look bad when the students don't meet expectations. We worry about the self-esteem of students to the point that we don't expect high performance or adherence even to a dress code. That’s just a snippet from Matt Johnston’s presentation which is an interesting look at expectations titled Going to the Mat: The Tragedy of Education posted at Going to the Mat. The Tempered Radical tackles a tough topic this week---what exactly should be taken into account when designing school accountability models that promote the kinds of teaching and learning necessary to advance America's future. After reading Breaking the Code of Silence I have to agree with Chanman…..the code of silence isn’t just for prison or the ghetto. NYCEducator was shocked to read that teacher unions oppose NCLB, and that democractic candidates for president are opposing it as well. Are you surprised that NCLB could be left behind? Maybe success isn't all it's cracked up to be. Maybe the obsession with superficial success is driving wisdom out of education. Diana presents in praise of failure. A comment to an older post got The Science Goddess wondering about grades and the grading process. Check out her post Medians on the Mind and Number Crunching. Rightwingprof says, “The only thing more over-rated in education than teacher creativity is student creativity.” Hmmm…..content or creativity? Read Rightwingprof’s post Your Inner Grandfather posted at Right Wing Nation. Recently a scientist on the importance on mental exercise and lifelong learning for healthy aging stated, "What matters is being engaged with life, continually exposed to stimulating activities, always trying to get out of our comfort zones, doing our best at whatever we are doing. A major typical misconception is that there is only one general intelligence to care about. In reality, we have many different cognitive abilities, such as attention, memory, language, reasoning, and more, so it makes sense to have different programs designed to train and improve each of them." Alvaro Fernandez presents Brain Training: No Magic Bullet, Yet Useful Tool. Interview with Elizabeth Zelinski posted at SharpBrains. Check out this review of a recent study that examines Reduced Verbal Ability in African American Children posted at Greg Laden's Blog. Pat presents A Teacher Who Inspired Me posted at Successful Teaching. Kilroy_60 wants all educators to realize that education is very much an individualized process and there are many paths to success. Check out his post Fear and Loathing in Academia. Fun, personal, interactive, and easy to particpate….The description of a great lesson, right? Mathew Needleman presents My Favorite Interactive Advertising Sites of the Year posted at Creating Lifelong Learners. Sometimes we just need a different prospective…it’s how we look at things. Batya presents Different Perspectives posted at me-ander. J.M. Holland presents a post mentioned in Alexander Russo's speed read recently titled Save Humpty Dumpty! posted at Circle Time "Lead From The Start". Larry Ferlazzo shares, “This HRW website now appears to be functioning well for the first time in a year, and has extraordinary online activities for geography and history.” Head on over here and also check out Larry’s Best Social Studies Websites for 2007. You know I’m already there! Woodlass over at Under Assault: Teaching in NYC gives us The Zen of Being an ATR (day- to- day sub) followed by HR (Human Resources) Connects or Does It? How she and other ATRs haven’t pulled their hair out I simply do not know. EdWonk presents Inflation.... It's Baaack! posted at The Education Wonks. My Bellringers presents From Podless to Podness posted at Bellringers. Christine presents Choosing a French Lycee (High School) for Your Child posted at Me, My Kid and Life: An American Single Mom Living in France. Lori Prokop Keyboard Culture Co-Founder presents Do Your Children Have Negative Self-talk? posted at Dr. Paula Fellingham Stay at Home Mom Expert at Keyboard Culture Expert Community. Carrie Kirby presents Paying for College: Rays of Hope posted at Parenting Squad. Have a profesion you can be proud of….Alex M presents Have a Profession You Can Be Proud Of posted at Online education: schools, colleges and universities distance learning. The Digital Student presents Top 7 College Application Mistakes posted at The Digital Student Blog. So much has been said about college application essays. This is because the subject is relatively quite critical. And yet neither applicants nor their parents seem to give this the attention that it merits. Many candidates believe that their high SAT and good grades will turn the trick for them. Often this does not happen. The reason for this is that hundreds, if not thousands of candidates also have high SAT scores and exemplary grades. In situations such as this it is the quality of the application essay tips the scales. Alex presents College Application Essays - Tips to Do It Right posted at Customessays.co.uk Blog: guide on how to write essays, courseworks, dissertations, assignments. Essay help, Dissertation Assistance, GCSE Coursework. Andrew Edgington presents a couple of tutorials regarding techniques on how to create some nice borders for your images and using the old photo effects in Create Cool Photo Edges with Photoshop and Andrew also presents Old Photo Effect in Photoshop posted at David Peters. And finally: This, like nearly all of our journeys around the EduSphere, has been both enjoyable and informative. We continue to thank all the contributors whose submissions make the midway's continuing success possible, the folks who give of their time to help spread the word, and the readers who continue to make it A Free Exchange of Thoughts and Ideas. I’ve been in and out all day today helping Santa to complete his list and when I stopped by the house long enough to drop off packages I was pleased to discover the 25th Georgia Blog Carnival has arrived for your reading pleasure over at Marketing Through the Clutter. Head on over and discover what the Georgia Blogosphere has to offer. The Carnival of Political Punditry can be found here and The Carnival of Family Life is over at Adventures in Juggling. Tune in next Wednesday when this blog will be hosting the 151st edition of the Education Carnival. 13 Ways to Say Merry Christmas! As units wind down to a close and final exams are taken for the nine weeks it becomes necessary to fill the time remaining---usually a day or two---with activities that matter. Children are focused on the vacation looming ahead of them and beginning brand new material is just a waste of time. I like to use the few extra class periods before the holidays practicing skills. One activity has to do with languages across the world and a web search where students attempt to find how many different ways the words Merry Christmas can be said. Other celebrations during this time of the year can also be included such as Hannukah. We end up making a huge collage of the different greetings and individual students map their county in two ways---individually and in relation to the rest of the world. A few facts are gathered as well regarding holiday traditions and presented to the class. A twist on this activity involves a review of crucial material students will need to remember during Spring testing. Nowadays there are many sites that also provide ‘Merry Christmas’ translations in various Native American languages. It’s a great way to review the Native American regions we studied back in August and September. There isn’t much to guess here. The man looks like General Washington at Valley Forge because it is George Washington. Yes, he does appear to be praying. My question to you is….would it be ok for me to share this painting with students and discuss the controversy it could cause? Still wondering about the dirt road from last week? Read my explanation post here. View other Wordless images here. I would say that after fifteen hundred plus days confined in small places with fourth and fifth graders I could be considered somewhat an expert regarding the mental and physical development process of eight, nine, and ten year old children. The boys and girls who pass through my classroom each year are a rare breed and care must be taken to ride the fine line between planning activities that ooze all the wonder of childhood and those that acknowledge the pre-teen angst that is always hovering in the back of my room like the smell of dirty gym socks or a few forgotten and half empty milk cartons shoved to the back of an extra desk. Students love to color, but would absolutely die if I tried to hang their color sheets in the hallway for others to see. They love to write letters to Santa but would never want anyone to know they chose that particular writing choice and would lie to their dying day they wrote about their favorite present of all time instead. To put it simply gather up a group of fourth or fifth graders and you won’t be able to find a single child in the group who will admit to believing in Santa. I still believe in Santa Claus. Yes, I know you probably think I’m silly, but I still remember that magic feeling in the the pit of my stomach that began right after Thanksgiving and became a little stronger each day until Christmas Eve. I still remember the joy of delightful anticipation as I would wiggle myself up underneath the Christmas tree so I could see the twinkle of the lights straight up through all of the prickly needles and the intrigue of each package and what it might contain. I still remember the excitement of standing in line at Rich’s Department Store at Greenbrier Mall in order to receive my 30 precious seconds with Santa to tell him what I specifically wanted. It did not matter that the man in the white beard was only a helper. He was my direct line to the Big Guy. 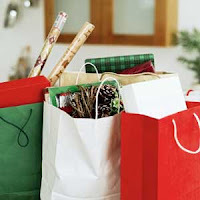 Christmas Eve morning I would begin mentally checking off each little family event that would get us closer and closer to Christmas morning when I could finally open the mountain of presents Mom and Dad would have under the tree and the joy of discovering what Santa had brought. First, I had to trudge along with mom to the Kroger at Jamestown Shopping Center for last minute things we would need. Then our last few Christmas cards that had turned into New Years greetings had to be mailed at the Red Oak post office. The rest of the afternoon while Mother hummed along to the oven timer I would try to make the time pass faster by keeping myself busy building a dining room table fort with a blanket or watching one of the three or four television channels we had back in the olden days. 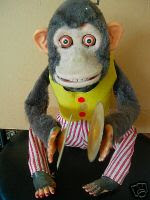 Finally, my grandfather would arrive with some sort of diversionary toy that was almost always the metal wind-up kind like the hopping monkey seen here with cymbals (kind of scary, huh?). Dad would come home from work and Christmas Eve dinner would be served. It would seem like the adults would talk forever and ever, and ever before they would venture into the living room and we could open a few…..a few of the presents under the tree. Mother always picked which presents we would open and invariably we would open new matching nightgowns and oh-the-horror- new underwear which Dear Sister and I would promptly place on our heads for the annual underwear-on-the-head picture (Dear Sister and I have now severely injured the psyches of our children with this custom as well). Over the years there were games, clothes, jewelry, Lite Brites, and various things for me to play school with such as a bona fide black board. One year Santa brought my sister and I a racetrack, another year a prize-winning pony walked up our front steps and greeted me by clop-clopping all over our very large front porch, and another year I received my 10-speed bike I eventually used to ride by some old boy who would eventually become my wonderful husband. I must have logged a thousand miles or more on that bike when I was trying to get him to notice me. I have never taught a child who didn’t celebrate Christmas in some way, so I always share my happy magical moments of Christmas history with my wee ones in hopes to get them to connect with their own customs and memories since memories become our history only to be shouted down each year that there is no magic and Santa simply does not exist. The more I profess to believe…the more I get shouted down. No, No, No I would counter. You have to believe. Santa can’t come if you don’t believe. It really pained my heart to see my students so jaded at such a young age regarding my friend Santa Claus, but no matter how much I tried to encourage belief they just wouldn’t believe. 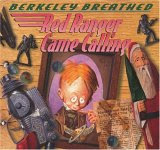 So, I was very happy some years ago when I found the wonderful book by Berkeley Breathed titled The Red Ranger Came Calling. It’s a lovely story set in the 1930s that lends itself well to a rollicking read aloud for students. The artwork is supurb. A few years ago I made color copies that I used with the overhead as I read….later I scanned them and placed them in a Powerpoint. It also is a story that the author’s father told the family each Christmas Eve so it fits even further into what I’m attempting to do with students regarding tradition and making memories. For various reasons the little boy in the book has become disillusioned with the adults in his life and feels the pains for a toy he knows the adults around him cannot afford in the Depression Era…..an official Buck Tweed (a cinema hero of the era who also was known as the Red Ranger of Mars) two-speed crime-stopper star-hopper bicycle to save 23rd century princesses from space nazis and princess nabbers. After hearing a rumor that Santa…..yes, the real Santa has retired nearby he seeks him out. The Red Ranger challenges Santa and basically says put up or shut up. Bring me what I want and prove you’re Santa. The Red Ranger demands the same present he knows that is out of the reach of the adults in his life….the special bicycle. During the Red Ranger’s explanation regarding what he wants there is a huge miscommunication between Santa Claus and the the Red Ranger and students discover the old man really was Santa at the same moment the Red Ranger does. You see Santa does deliver the bike. It’s just that he misheard and thought the Red Ranger wanted a treed bicycle instead of a tweed bike. The delivered regular run-of-the-mill bike has been left in a tree instead of the usual spot by the tree. One of the best moments of my Christmas each year has been turning to the final page and showing students the picture seen below with the words “If you don’t believe me it’s still there.” As you can see from the image below there is indeed a treed bicycle. When children still doubt me I ask them to head over to the computer and search for the setting of the story which is Point Robinson on Vashon Island. 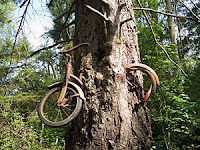 My doubters do this and are again astounded when they locate the very picture in the book and verification that there is indeed a treed bicycle located t here. Mouths drop open and several conversations start at once. Suddenly my students who think they are too old to believe in Santa rethink their priorities and for a minute….just a minute….we are all children again wallowing in the wonderment of Santa Claus and we all agree……it’s not such a bad place to be. The Amazon page for The Red Ranger Came Calling has additional information and reviews. Here at home Dear Son is home from college and I hope I have laid in enough food supplies to get us through at least a day or two before I have to go back to the store. He’s been busy blowing the last of the Fall leaves away from our yard. Unfortunately, with basically no rain since May he also blew up quite a dust cloud. Even though it looked treacherous and some people were in dire straights in the Midwest earlier this week I couldn't help but be a bit envious of the precipitation that had come their way. Dear Daughter isn’t off from school until this Friday. 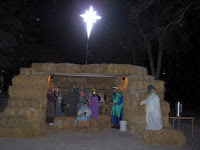 She’s been busy a few nights this week helping out at the local Methodist chuch with their annual live nativity. Many people from local churches, including ours, helped out. It’s nice to see everyone pitch in and help this time of year. Home renovations continue, light fixtures have been bought, and furniture ordered, but Christmas presents???????????????? Nary a one has been bought so if any family members are reading this there is no use in plundering because there’s nothing to find! I must shop in ernest next week! Alasandra's 13 regarding turquoise (I still have some pieces dating back to the 70s) and Denise’s 13 Things About Sir Francis Drake. The Mom's Blogging Carnival is up over at Australian Women Online. You might recognize a contribution there and find other great reads. I love dirt roads, and Georgia is simply full of them. Unfortunately you have to travel further and further from the environs of Atlanta to find them anymore. When I was 18 and a newbie on the college campus of my parent’s choosing I was a member of the Dirt Road Club. The requirements were simple…..you had to have enough money to invest in either gas or an appropriate beverage or two for you and your fellow club members, you had to be willing to devote an occaisional Saturday or Sunday to what could be an all day, all night road trip, and if you were the official driver for that trip you had turn off the main highway everytime you came upon a dirt road and follow it until you couldn’t follow it any longer. Needless to say I’m quite the expert when it comes to private drives and logging roads all over North Georgia. Just like the explorers of the 1500s and just like those folks who brave the elements to climb Mt. Everest members of The Dirt Road Club ventured forth because they were compelled to. Yes, there were some dirt roads that were a bit scary, some that had a Deliverance feel to them, and some were just plain dangerous. Others were pure gems. Once when riding along through a forest the trees suddenly cleared and we found ourselves on a ridge where you could see mountain rise after mountain rise in the distance. Another time we found a mountain stream complete with waterfall and on the hills rising up all around us were hundreds of mountain laurel in full bloom. Those were the moments that kept us going down all those dirt roads. This week’s wordless image was a dirt road. The image received many comments regarding perspective and the fact that the road in the photo looked like a very long road. 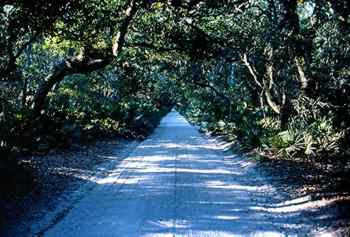 It does my heart good when so many take the time to bring out other details like the palmetto, live oaks, and the shell road like Shannon and Carmi. 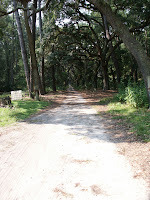 To find out more about Ossabaw’s long, dirt road take a detour to my post over at Georgia on My Mind. Right after Thanksgiving I began searching for something…..anything regarding the 2007 White House Christmas Card. I had so much fun last year researching the article I wrote and published here and at American Presidents titled Have You Received Your Christmas Card From the White House Yet?, and I wanted to make sure I posted this year’s design as soon as it was made available. After an exhaustive search I finally found an image. I’ve posted the inside of the card here. Wouldn’t you like to know what the front looks like? Well, then head on over to the American Presidents Blog, of course. A huge thank you goes to Michael Swartz at monoblogue. He actually had the honor of receiving the card you see in the image above. 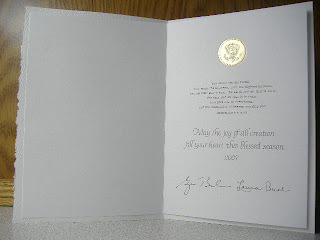 He receives my undying gratitude for giving me his permission to post the pictures here in what seems to be the second time the official White House Christmas Card for 2007 card has had a mention along with an image on the Internet to date. Hmmm…..I wonder if I have a scoop…. Every year I sit through Rudolph the Red-Nosed Reindeer at least twice. I believe I actually enjoy watching it more as an adult than I ever did as a child mainly because I get more chances to see it than just the one time. This year Dear Hubby and I watch it all alone as our children think they are "too old" (22 and amost 15). 2. King Moonraiser says, “A toy is never truly happy until it is loved by a child.” That's one reason why I never wanted to give my toys away.....I was afraid they would think I didn't love them. 5. Yukon Cornelius to Rudolph: Douse your nose and run like crazy! 6. 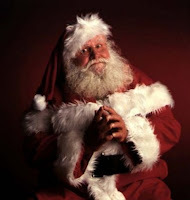 Santa says, “How can I eat? That silly elf song is driving me crazy!” I always thought it was neat that something bothered Santa. 7. After returning from what looks to be a fatal fall from a cliff Yukon Cornelius states, “Did I ever tell you about bumbles? Bumbles bounce! The scene where he falls of the cliff was really traumatic for me as a child...I always forgot that he came walking back at the end. 8. Sam the Snowman says, “Meanwhile, the elves are bustling with activity. Christmas is over, but they still keep busy with lessons in elf improvement.” Gee, even elves have staff development. *Hermey is the only elf without pointed ears? *When Santa’s sleigh finally takes off into the storm near the end of the film, it’s being pulled by SIX reindeer instead of eight, with Rudolph leading the way. Dear Hubby pointed this out to me the other night. *Most of the singing and speaking cast were Canadian. *Yukon Cornelius’ stalwart sled dogs include a beagle, a Scottie, a cocker spaniel, a poodle, and a chihuahua! *After an outcry of protest insisting on a happy ending for the Misfit Toys, new scenes were animated depicting Santa’s sleigh rescuing them and finding homes for them all. *When Yukon Cornelius throws his pic axe into the ground and takes it out and licks it, he’s checking neither for gold nor silver. The original concept for the special stated that Yukon was in fact searching for the elusive peppermint mine, which he found eventually. Look at this picture very carefully. What do you notice about it? My explantation for last week’s fish can be found in my post All Hail the Sacred Cod. The other day while I was waiting for students to complete an assignment I noticed one particular little girl had removed her shoes. “Ouch!,” I said as I noticed the red puffy blister on each heel. I directed her to follow me to my desk where I gave her a Q-tip with Neosporin and two Band-Aids specifically for blisters. I mimicked with my own feet what she should do and sent her off to her desk again. Once the class had finished we still had a few minutes remaining. Not wanting to waste a minute I first asked the little girl if she had done what I had asked and then told her she should find it easier to get her shoes back on. Then I asked the class if they would like to hear a little story that involved a blister and the National Christmas tree. You can read the rest of the story over at the American Presidents Blog. What's Right With Public Education? The state of Georgia is often the poor step-child when it comes to good news regarding education. I thought it was time to share some news regarding Georgia schools that are making great strides with test scores and innovative programs. Davidson Fine Arts Magnet School is a Richmond County school that posts the highest SAT score for the state year after year. The Georgia Public Policy Foundation consistently names Davidson’s middle school program as the best in the state. Students who wish to attend Davidson must undergo an interview and maintain a B average. They spend much of their school day in dance, chorus, theater, and fine arts classes. “We try to nurture them from sixth grade on,” the principal, Vicky Addison says. “They get caught up in the culture of the school, which is to work hard and excel.” Addison believes the key to success for her students is their involvement in the arts. Students learn discipline early on; and they learn to juggle academics and the arts, which requires them to be organized. I'm glad Richmond County offers this type of school in their district. I wish every Georgia county had a fine arts school, however, isn't the school already set up for success by admitting only students who have a B average or higher? International Community School in Dekalb County is a charter school that has a very diverse population and many ELL students. After two years, most are passing the CRCT. It’s a feat that has earned the charter school national attention. This year, International Community School was named a Distinguished Title I School for its success in closing the achievement gap between students with limited English and their American-born classmates. A program called “Parents as Teachers”, small classes, an assistant in every room, and a no grades policy (since many of the clients/parents would not understand them) are just some of the things that point the way to their success per the educators at the school. Instead of issuing grade reports parents and teachers meet to go over the standards and teachers report if the student has met or exceeded the standard. They also suggests strategies to help the child master the standard if they are behind. A Saturday school program was started last year with four Afghan girls whose siblings attended the school. Now students bring parents, grandparents, brothers, and sisters for two hours of intensive instruction. It seem that the success this school has had speaks volumes regarding what can be done with parent enthusiasm and involvement. When our grade offered Saturday school two years ago less than ten kids showed up and parents merely dropped them off and then arrived 15 to 30 minutes after the appointed time to pick them up. Tyrone Elementary School is in a middle class suburb of Atlanta, and many of the parents are educated. It’s also a small school with only 350 students. An average elementary school in Atlanta’s suburbs generally contains at least 500-600 students and some have as many as 1000. The staff completed a book study with the book Whatever It Takes. After reading the book fifth-grade teachers opened the computer lab up before school so students who arrived early could practice math problems. First-grade teachers divided students into reading groups based on their reading skill. By doing so struggling students received more time and attention. Art and music teachers did whatever it took to give students who needed it help in other areas. The staff developed a school creed that students recite every day; I will be responsible, respectful, safe and ready to learn. All third graders at TES passed the state mandated test and only three of the fifth graders had a problem passing the gateway test. Whatever it takes……..The passing rate for their third and fifth graders is something to brag about. The number of students who don’t meet the requirements are generally much higher across the state. If we could only get the kids motivated without the prizes…..however, I love the part concerning building relationships. It’s important for all students, but it is essential for those students who have chronic motivation and behaviorial issues. So, now I put it to you....What do you think about these schools? Please share something your school or district is doing that has been successful. Please click through and read the entire Georgia Trend article here. I was somewhat amazed that I didn’t have someone guess the identity of the sacred fish I served up as my wordless entry last week. The identity of the fish is something I have shared with students over the years once we begin our discussion regarding the 13 colonies. In the past students have identified three colonial regions being the New England, Middle, and Southern colonies. We examine each region and discuss how the natural environment played a part in their early economies, and this is where the fish comes in. This week’s wordless image is known as The Sacred Cod of Massachusetts and hangs in their State House. There is much pomp and circumstance regarding the sacred fish. It hangs above the entrance to the room with legislators meet, and it can be seen clearly from the visitors’ gallery. The Speaker of the House faces the cod as he address the body of legislators during their law-making sessions. The fish is always headed in the direction of whichever side of the aisle has the most members and is therefore in power. The current fish was placed in the State House in response to a suggestion by John Rowe on March 17, 1784. When the lawmaking body moved to a new State House bulding in 1798 the fish made the move as well. Even though the cod has had a place of importance in the State House I find it interesting that the lawmaking body didn’t vote until 1974 to name the cod as Massachusetts’ state fish. Why a cod? The fish symbolizes how important cod fishing was to the early settlers and later citizens of Massachusetts. It is considered to be an ancient symbol of prosperity for the people of the state. The five foot long cod that currently hangs in the State House is carved from pine and is the third one known to exist. The first sacred cod was destroyed in a fire in 1747, the second during the Revolutionary War. In a story that comes straight out of the movie Animal House the Sacred Cod was actually stolen by some staff members of the Harvard Lampoon in 1933. The missing cod sparked a statewide search for the sacred fish that is hilariously recounted here. The weather guy this morning said the temp today would reach up to at least 70 today. For those of you who don’t know it isn’t supposed to be 70 in Atlanta during December….far from it. We are in the midst of home renovations…the kind that takes years instead of months for some crazy reason. At any rate new floors are down in the kitchen, dining and living rooms, new appliances have been installed in the kitchen, and I have too many decisions to make regarding lamps and window coverings. Yes, I know things could be worse. We did manage to get our tree up this week. If you will remember we were painting last year, and for other reasons I simply didn’t feel like putting up a tree last year. It’s nice to reconnect to all of the different ornaments again. Lessons on how MySpace and Blogger should not be used are evident in this news story along with some of the fallout here and here. The supposed blog by the mother, Lori Drew, who tricked Megan Meier, is found here. The comments are lengthy but are interesting. Carnivals abound this weekend…..one of the Christian Carnivals can be found over at Beyond the Rim. They were nice enough to include a post of mine regarding being dead or alive. The Carnival of Education can be found over at So You Want to Teach? The postings I enjoyed the most from the carnival were Birthday Girl from Bluebird’s Classroom and Celeste Archer’s plea from the Schools For Tomorrow Blog. My own posting in the carnival regarding a dream teaching assignment hasn’t garnered anymore comments than what were already there. Could it be educators see a dream assignment as something so elusive they can’t even fathom one? Once again I missed the Potluck Carnival over at Ms. Whatsit. It’s not to late to snag some holiday recipes and while you’re over there tune in to some of her other postings. The Georgia Carnival is being hosted by Drifting Through the Grift. Head on over and see what Georgia bloggers have to offer. It’s hard for me to believe this carnival will celebrate its first birthday after the first of the year. Time does fly. Under the category botched history…..There’s a reason why I don’t watch The View other than the fact I’m busy during that time…Sherri Shepard asserts Jesus Christ came before the Greek Civilization. Huh? Finally, make sure you actually read all of Mitt Romney’s speech regarding religion and government given earlier this week before you form an opinion. Here's the Good Morning America page with links. Last week I shared with you an unfinished painting for my wordless image. It was begun by Benjamin West (pictured left) who was born in Pennsylvania in 1738. His most formal lesson as a boy regarding painting was at the hand of local Native Americans who taught him how to mix paint using clay and bear grease. By 1763 he had traveled to England where he became one of the leaders of the Royal Academy even though he had no formal art training and couldn’t spell very well either. Once in England West began to work on several commissioned works at the request of King George III. Though West left the colonies before the American Revolution he did have strong connections there. He had been named for Benjamin Franklin, was a great friend of his, and had painted a portrait of him. I usually end my American Revolution unit by showing students the unfinished work of West, and I tell them the purpose of the painting was to memorialize the signing of the Treaty of Paris (1783). I ask students to think for few minutes and based on what they have learned write a few sentences in their notebooks regarding why they think the painting is unfinished. It’s so easy to present content to students regarding a war and tie it all up in a nice little bow by telling them Cornwallis surrendered at Yorktown, the British sailed home, the Treaty of Paris was signed, and then BAM…..we move on to the formation of American government. It just wasn’t that simple. Generally the British were not that happy with the surrender, and anti-American sentiment was high. True, British citizens were tired of war, but they didn’t like loosing either. Negotiations for the treaty went on for sometime. Benjamin Franklin and his group of negotiators held firm regarding the independence of America and that the British nation should formally recognize it. Some historians have stated that the actions of the American negotiators are the greatest triumph to date of American diplomacy. However, it must be noted that the treaty was only a stop gap measure and many problems remained between the two nations until the signing of the Jay Treaty or Treaty of London in 1794. 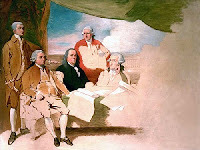 In the painting from left to right we see John Jay, John Adams, Benjamin Franklin, Henry Laurens, and William Temple Franklin, the grandson of Benjamin Franklin. Yes, I’m aware that he resembles George Washington in the painting. My students usually pick up on this as well. Of course we know that Washington was not part of the negotiations. He was busy doing other things. The team of Jay, Adams, and Franklin did the majority of the negotiations. Henry Laurens, former president of the Continental Congress, was one of the Peace Commissioners, but he didn’t sign the primary treaty. He did serve an important purpose involving a second agreement that involved the Netherlands and Spain. Laurens (picture at left) who hailed from South Carolina was a major planter and slave holder. Ironically his former business partner in the slave trade, Richard Oswald, was the leader of the British delegation. Laurens’ son, John, was an aide-de-camp for George Washington and was known for several brave exploits during the American Revolution. He also petitioned for the inclusion of slaves into the Continental force in return for their freedom. Georgia’s Laurens County is named for John Laurens. I have detailed bits of his life over at Georgia on My Mind. The unfinished section of the painting was for the British delegation, but they refused to sit for Mr. West. Their disdain and outright hatred for the Americans kept them from consenting to become immortalized for all time. Many of my students connect to the many disagreements they have with their friends and realize the British really knew how to hold a grudge. Their refusal to sit for the painting is a powerful symbol for students, and serves as a preview for problems ahead that eventually lead to the War of 1812. By presenting this painting to students I provide a few details regarding peace negotions and press upon the fact that a peace treaty doesn’t mean that all issues are resolved. Some are ongoing and eventually lead to another war. In a recent Education Week article titled Advent of Digital Video Triggers Shifts in School Market by Andrew Trotter( Vol.27, Issue 12, Page 10)) video is referred to as a core resource that can clarify concepts for today’s media-oriented children and draw them into their lessons. I strongly agree. The article goes on to mention that many video providers are beginning to provide their materials online which saves them from shipping hassels plus serves the ever growing number of customers who want to view video streamed over the Internet. One provider mentioned---Hot Chalk in partnership with NBC News---opened an an educator-friendly archive, with two-to five-minute video vignettes drawn from 70 years of archival coverage, organized by curriculum topic and augmented with extensive curriculum-planning resources. Per the article there are close to 130,000 teachers registered for a free trial that will end in January. After the first of the year the service will cost $1,999 annually per high school and $1,499 per elementary or middle school. Last year I used United Streaming for many of my video clips. The thing I liked about the use of the videos online is digitization makes it easier for the videos to be segmented. They can be viewed from beginning to end or particular clips can be shown that meet your standard’s requirement. Often during a lesson where I was introducing new content I would alternate between a video clip, the text, and a map I might have drawn on the board to keep the flow of content moving. United Streaming along with many other video companies provide the capability to search their site based on particular state standards. Mr. Trotter’s article goes on to state that education video sites are now including competancies and concepts to go along with the standards, lesson plans, and calendar functions. The one thing educators have to be wary of is the type of video sources they use and the time-tested advice regarding watching a video or a clip completely through before showing it to students still applies. Videos from Wildscreen, a British charity based on Bristol. My articles regardings video use can be found here. My article regarding a lesson involving Dr. King’s birthday using United Streaming can be found here. Read other Thursday Thirteen lists here. 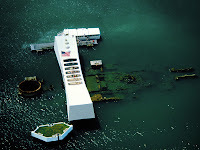 The picture with this post is the USS Arizona memorial. Many people think this fish is sacred? Do you know why? Join in on the Wordless Wednesday fun! Growing up the only male in my home was my father, so when my sister got married it was a bit traumatic. It was a bit traumatic for my brother-in-law as well. My father was used to the drama, but my dear brother-in-law wasn’t. Somehow we all managed to get through the bad times as well as the good, and he and sister dear are still married after almost 30 years (one month to go) of marriage. Today is my brother-in-law’s birthday, and I wanted to give him his 15 minutes of fame. He’s a great father, husband, and brother. He works hard and deserves every bit of pleasure he desires. I don’t know how he does it but while the rest of us continually show more of our age, he just gets better looking each year. Wow, I can’t wait until he’s 85! Happy Birthday! Ever wonder how I might handle students closing in on my at me desk? Ever wonder about all those trees on the grounds of the White House? Ever wonder if my students try to impress with knowledge they come across? The answers to these questions can be found in my post All the President's Trees over at American Presidents. Have you started addressing your Christmas cards yet? I'm hoping for a Bethlehem postmark. When my son was younger my home and yard was generally full with other young men playing in the creek, shooting baskets, and eating my groceries. Many a Saturday morning found my husband and I winding through a maze of young male bodies shrouded in a various assortment of scrounged bedding on my living room floor. Two of those young boys who are brothers grew up to be fine young men who joined the U.S. Army after graduation. I've written about them before. It was prayful relief Thanksgiving morning to walk into the embrace of the younger brother, Seth, and feel his now powerful arms and hands hug me. It’s funny how things change because those are the same arms and hands that would wipe away tears of anger when his older brother and my son would ban him from whatever activity they were engaged in. He would quietly come in the house and begin a video game or play with my daughter as she stood in the playpen waiting for attention. He never tattled, but I knew why he came inside. The same childish arms are now unrecognizable with large muscles and scary tatoos, but he’s earned them, and I will excuse almost anything from him. 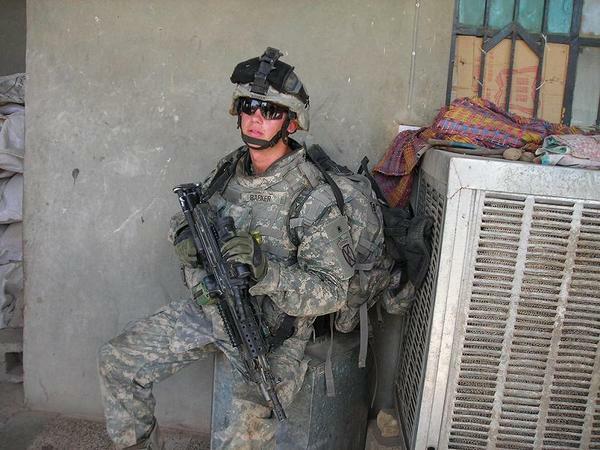 When Seth left for Iraq we braced ourselves for what would be a long tour of duty. He’s in the infantry and would be living out in some of the most dangerous territories. During these long months I stopped listening to the news reports because it was just too much to bear. He’s home now. He’s safe. He will continue to serve his country along with his brother and sister-in-law. We are very proud of all three of them. When I asked Seth if he thought his time in Iraq was well spent. He was very insistant that we are making a difference for good in that country. He told me that things had improved so much since he had first arrived. Sadly I heard of a different homecoming for another soldier the same day. A nice young man I remember as a cute little boy gave the ultimate sacrifice for his county. Peter H. Burks was my brother-in-law’s cousin. Years ago when his family still lived in the Atlanta area I would often see him at family dinners at my sister’s home. I remember a cute and mannerable young man who had many things going for him. 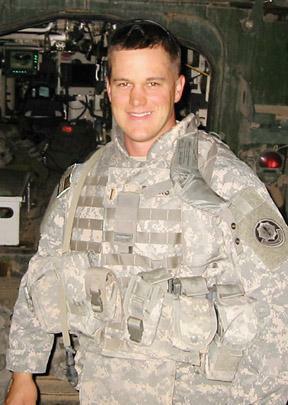 Army 2nd Lt. Peter H. Burks died November 14th when his vehicle was hit by a roadside bomb just outside the Green Zone in Baghdad. Peter received shrapnel wounds to his head and died at the scene. He was assigned to the 4th Squadron, 2nd Stryker Cavalry Regiment, Vilseck, Germany. 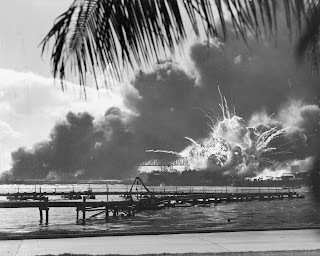 In newspaper interviews Peter’s father, Alan Burks, stated, “He told me over and over and over again, he said: ‘Dad, my job is to get my 17 guys home safe…Then after that I’ll get myself home safe.’” Apparently Peter’s first words when the explosion occurred was to ask his men, “Are you OK?” Then he stated he was OK, but he wasn’t. According to the officers who were there, he was conscious for a short period of time. Before joining the army Peter, who was 26, had graduated from Texas A & M University and worked for the Dallas Desperados arena football team and FC Dallas soccer in marketing. Feeling the need, as so many of our young people do to serve his country, he joined the army in 2006 and had been in Iraq three months. When I Googled Peter’s name I was amazed at the number of links that already exist to various news stories and remembrance sites. This is the Stryker Brigade News site and it has numerous links to interviews with Peter’s parents and other sites as well. Another news article can be found here, and this is a blog that remembers fallen heroes. I can’t imagine what Alan and Jackie, Peter’s parents, are going through. What do you say? How do you help at a time like this? Jackie summed it up pretty well in an interview when she stated, “The way I could hold on as a mother is because I have that relationship with Jesus Christ. Peter accepted Jesus Christ as his personal savior as a child.” My thoughts are with Alan and Jackie and the rest of Peter's extended family. Peter’s e-mails home were very thoughtful about our country and the current situation we find ourselves. I really feel that our country is in a very pivotal time right now. The fact that so few people are really plugged in to what’s going on in the world and in our country really scares the crap out of me. Do I still believe in America and what we are founded on and meant to stand for? Absolutely! I just want our country to be the best it can be and our people to be the best we can be. I wonder......Can we all strive to achieve a fallen soldier's desire, or will the majority of us remain unplugged? Thank you for visiting. My more current postings can be found here.